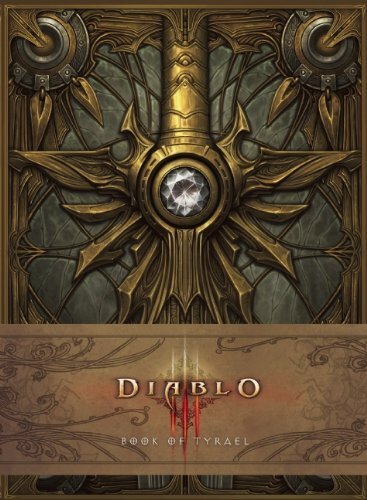 Here's another great book into the lore and characters of Diablo III, this time from the perspective of Tyrael, former Archangel of Justice turned mortal. It's a collection of information he has documented on characters, events and other truths he has found out. It's written in a first person account which gives it a nice feeling of authenticity. The real authors are Matt Burns and Doug Alexander and they have done a good job matching the tone set by the first book Diablo III: Book of Cain. The illustrations in the books are a mixture of pen and ink, and pencil sketches. They are terrific. 18 artists contributed their artworks, among them are Joseph Lacroix, Iain McCaig, Nicolas Delort and Jean-Baptiste Monge just to name a few. There's usually an illustration for every two pages, some are double page art, and some are double page text. The book also comes with a double side printed poster featuring the Leoric family and other characters from the Old Tristram. I've a few complaints about the book though. One's about the colour choice for background on which the words are printed. The background can be quite dark making it difficult to read the black text. The other complaint is page numbers are shown selectively on pages making it hard to find the artists who created the art for any particular page. Lastly, there's no content page. Despite those minor issue, this is still a great book for Diablo fans.